As the smoke from the drivers in my Infinity Reference Standard III speakers slowly dissipates into the air, I’m thinking it must be good to be Tommy Castro. Tommy and I had a conversation at the BMAs in Tunica where I told him I thought he had a better record than Painkiller in him, and he agreed with me. Painkiller went on to receive the album of the year that night. Tommy’s first release on Alligator, Hard Believer, to me is clearly a better record than Painkiller and a serious contender for all the gold as well. My Infinity’s are begging me to not hit “play” again but we’re going for it. Tom Poole’s trumpet is front and center as Tommy tells us about a woman he’d be better off staying away from. We’ve all met that one devil woman we can’t run away from and it’s going to end badly. That’s the premise of our first cut, “Definition of Insanity.” Blistering notes from Tommy’s strat echo that premise, “Is it love or madness…we’re together tonight…we know where it’s headed baby…but its getting harder to fight!” In this case it’s better to have loved shortly and intensely than to never have loved at all. Confession time appears to be next in “It is What It Is.” “I was a mover…I was a shaker…you had a girlfriend….I’d try to snake her…I’ve been lost at sea…I’ve been lost in space…and when I fall in love…I’m all over the place!” It definitely is what it is. “Hard Believer,” the title track, is up next. “I believe…I believe…you’re the one…I believe…I believe…my time has come…I’ve been a hard believer…but my heart has come undone…I believe…I believe…you’re the one!” Tommy finally feels like he’s found the one good woman he’s been looking for and this time, hopefully it will last. We’re early into this disc and Tommy’s guitar playing is just dead on. 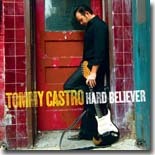 Musically, this disc features some of Tommy’s best guitar work ever. “Monkey’s Paradise” cranks up the tempo, and the horns of Keith Crossan and Tom Poole are back in play. Here we find Tommy just slightly out of touch with his reality. “I walk around and mumble…and talk to myself all the time…I’ve got a real bad case…of what they call the monkey mind!” There are just days where life gets in the way of living and taking the time to sort it all out just boggles the mind. There’s just not enough caffeine to go around and make sense out of it all. But it will pass and tomorrow will be here soon. Tony Stead provides the keyboard intro for our next cut, “Ninety-nine and one Half.” Tommy’s in love again, but its all or nothing. Anything less than 100% won’t work. “Some time a man need…a little love and affection…yeah…baby…ninety-nine and a half…just won’t do…I’ve got to have 100…yes I do!” Tommy cranks up another blistering solo on his Strat and I know why my speakers surrendered to the aural onslaught they received from Hard Believer. Next up is “Backup Plan.” Tommy’s got his eye on a woman who’s in a relationship but checking him out. “One day you’ll be free baby…and I could be with you…now don’t misunderstand…I’m no back door man…but if things don’t work out baby…I’ll be your backup plan!” You know he will. We shift to high gear on what is my favorite cut of the disc, “Make It Back to Memphis.” Tommy headed down to Tunica to play the tables and it got to be a very long night. “Headed south on Highway 61…been a long time…since we’ve made this run…they got riverboat gambling….in Tunica, Mississippi…I’m praying to God…that Lady Luck is with me!” Tony Stead’s keyboard work on this tune is phenomenal and Tommy’s thanking the good Lord that he made it back. “Wasn’t keeping track…of just how much I drank…should have stashed another $20 for Ray’s gas tank…now the needle’s on empty…I can see it by the light of the moon…if we make it back to Memphis…we’re going to have to make it on fumes!” “Make It Back to Memphis” will probably be in strong contention for song of the year as well. At this point in the writing season, Hard Believer is the best disc I’ve heard all year. Tommy has outdone himself this time with great support from his band and amazing production work by John Porter. It’s a disc that is sure to garner multiple BMA nominations come awards time and deservedly so. I’ll be in Telluride when Tommy comes through Phoenix so I won’t be able to congratulate him in person on his amazing new record. This review will have to do. Great job, Tommy! !